Tag line: "THE PULITZER PRIZE PLAY of New Orleans' Latin Quarter...of a Lonely Girl...of Emotions Gone Savage!" Marlon Brando is, hands down, my favorite actor, and the fact that he occasionally “phoned in” his performances (a la 1978's Superman) makes me cherish his great turns even more. And there have been some truly incredible ones, from On the Waterfront to The Godfather and many in-between. Yet his crowning achievement came in 1951, when he played Stanley Kowalski in Elia Kazan’s screen version of Tennessee Williams’ A Streetcar Named Desire. The scene where he’s standing at the bottom of a staircase, dripping wet and screaming “Hey Stella!” at the top of his lungs, is one of the cinema’s most recognizable images, but it’s the intensity Brando brings to this sequence and every other that ranks his performance among the greatest in motion picture history. Blanche DuBois (Vivien Leigh), a schoolteacher and former Southern Belle who’s fallen on hard times, travels to New Orleans to move in with her estranged sister Stella (Kim Hunter) and Stella’s husband, a working class stiff named Stanley Kowalski (Brando). From the moment they first meet, Stanley and Blanche don’t get along. Blanche objects to Stanley’s “rough” ways, while Stanley wonders aloud if Blanche is truly as bad off as she claims to be. During the course of her extended stay, Blanche tries to convince Stella that Stanley is the wrong man for her, while at the same time engaging in a romantic relationship with Mitch (Karl Malden), the nicest of Stanley’s poker buddies. Yet, through it all, it becomes increasingly obvious Blanche is losing her grip on reality, and that the ghosts of her past continually haunt her, draining away what little life she has left. 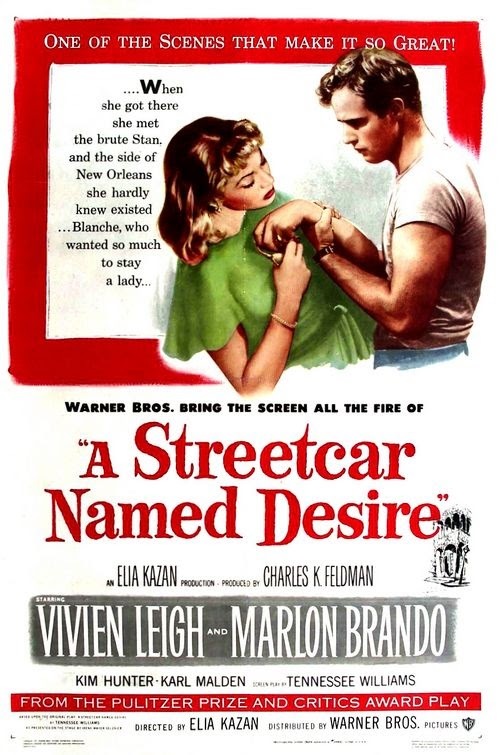 Aside from the opening moments, where Blanche arrives at the train station and meets Stella at the bowling alley, A Streetcar Named Desire takes place on a single set, which, under normal circumstances, might have resulted in a film that was too “stagy” (a common critique aimed at many movies based on a play). Yet never once do you feel it’s the least bit stage-bound, and the reasons why are the performances of its two stars. Occasionally lost amidst all the Brando hype is the tremendous work of Vivien Leigh as Blanche, the emotionally shattered Southern Belle whose life of privilege has been systematically stripped away from her. It’s clear early on that Blanche is a wounded soul, a woman clinging to a past that, even by her own admission, was never as happy as she would have liked. Still, despite the fact she now depends on Stanley and Stella for her very survival, Blanche can’t help but judge the two of them, telling Stella Stanley is “common”, and that she should have remembered her upbringing and never married him. Yet, even here, where Blanche could have come across as aloof, Vivien Leigh allows a little humanity to slip through. From the moment she utters her first line, we know Blanche is a complex character, and Leigh manages to convey every aspect of her persona, bringing to life a proud individual who, due to the trials and tribulations she’s been subjected to, is, on occasion, as meek as a lamb. On the opposite end of the spectrum is Stanley Kowalski, a handsome yet brutish man who’s none too happy to be playing host to his wife’s sister. Unlike the multi-layered Stella, Stanley is an open book, revealing every nuance of his personality in the movie’s first twenty minutes; his abrasive nature; his sharp, sometimes violent temper; his love for Stella, and his mistrust of Blanche (when he hears the DuBois family estate has been “lost”, he immediately thinks Blanche sold it, and is keeping the money all to herself). Every moment he’s on-screen, Stanley is both the film’s most repulsive and most engaging character. Our natural instinct to look away whenever he cuts loose, breaking windows and smashing dinner plates, is overtaken by Brando’s sheer magnetism, keeping our eyes glued firmly to the screen. In the hands of a lesser actor, Stanley might have come across as one-dimensional; in Brando’s, he’s positively electrifying. It’s almost as if the term “searing drama” was coined for this film; an emotional rollercoaster set in the dingy district of New Orleans, where the heat and humidity is so palpable that it resonates from the screen, A Streetcar Named Desire has taken what was an award-winning Broadway play and transformed it into one of the all-time great movie dramas, featuring not one, but two performers at their absolute zenith.